Architectural and Interior Design service from concept to completion in Richmond. Planning, Feasibility Assessments, Technical Drawings, Interior Design, Immersive 3D Modelling, On Site Visitation and Contract Administration. Book A Free Consultation. 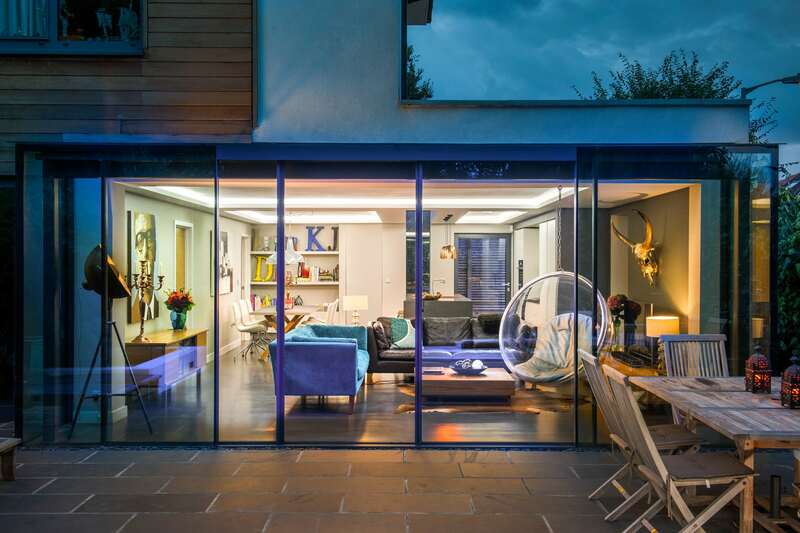 Based in South West London, we are an award winning architectural practice, priding ourselves on our creativity and passion to tailor and deliver bespoke architectural solutions for our clients. We are a RIBA Chartered Architects practice founded in 2010. 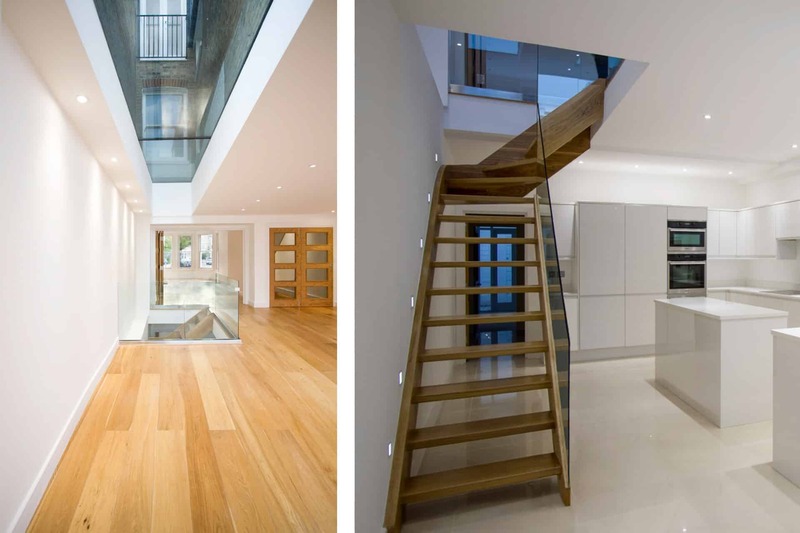 Our team has a high level of experience in the residential sector, working on a wide range of projects including high-end residential, new build apartments, house design, basements, extensions & loft conversions. From our base in Battersea we take on projects within London and have good relationships with Richmond’s local planning authority, Richmond upon Thames Council. 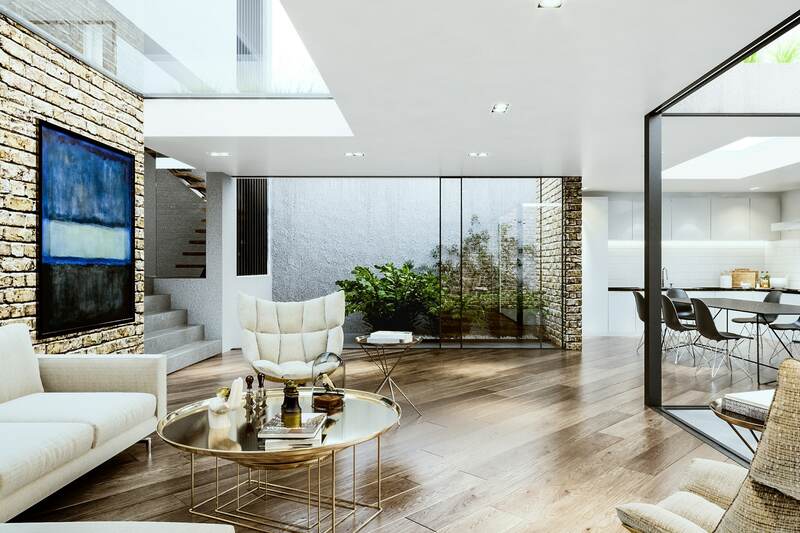 We will diligently guide you through each stage of the process from conceptual design / planning approval through to the completion of your dream project in Richmond. Armstrong Simmonds Architects will work with you to develop a concept design, sketching layout options to explore the potential of the property. We will also carry out a full measured survey of the property in Richmond and its surroundings, allowing us to produce an accurate set of drawings. Following on from the briefing we will prepare a set of scale drawings reflecting the range of ideas discussed. 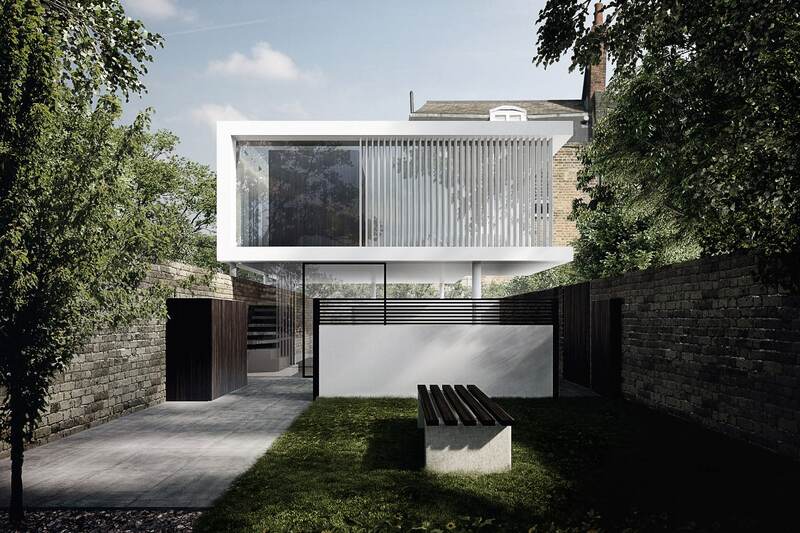 We will prepare and submit the planning application, liaising with the Richmond’s local planning authority, Richmond upon Thames Council, as needed throughout the process. Our extensive experience will help facilitate a smooth planning process. To help you visualise the space in three dimensions we can produce internal and / or external views of your project. This can also be a useful tool to demonstrate the merits of the scheme to planners. We will produce detailed technical drawings including drainage and electrical layouts, consulting with you to ensure the design meets your needs. We will then submit to building control and manage the approval process. As part of this service we can assist you in appointing other consultants, for example the structural engineer or party wall surveyor. We offer interior architecture and design for a high spec finish. We can produce further detailed information integrating specialist glazing components, floor finishes, joinery and bespoke staircase design as required. We provide Interior design services ourselves or through collaboration with other London based Interior Designers, who may also be appointed by the client. We are happy to specify FF&E (furniture, fittings and equipment) for the project, providing a complete “one-stop” shop for your development. We will help you make an informed choice on an appropriate contractor. We maintain a selective tender list of contractors especially in the local London area, who we have experience working with on site. We will prepare tender documentation and appraise their quotes. Armstrong Simmonds Architects facilitates the implementation of the design by administrating a contract between you and the contractor. Among a wide array of services, this will include undertaking site visits to monitor the quality of construction and handle any on-site queries from the contractor. 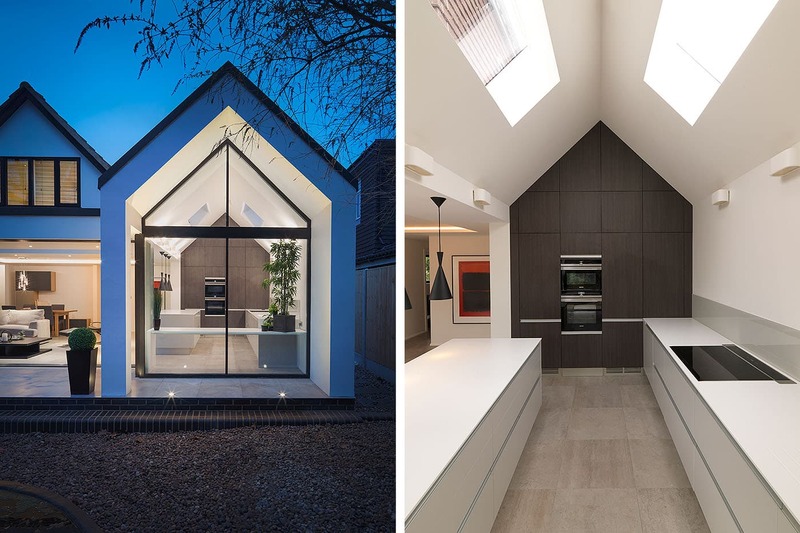 The clients for this modern rear and side extension were looking to expand their three-bed house, creating a large open plan kitchen and living space while updating the facade of the existing house. This three-bed house in Battersea was completely transformed with a side infill extension, loft conversion and full internal refurbishment throughout. 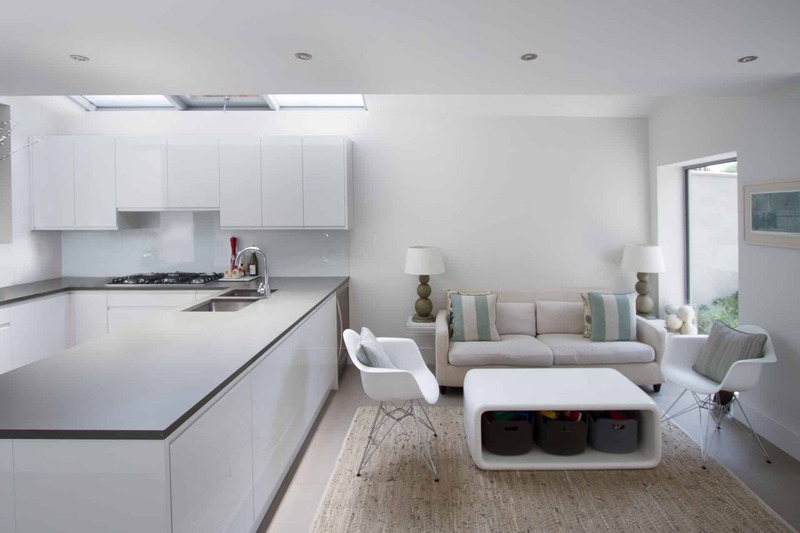 This side infill extension creates a spacious open plan kitchen, living and dining room. Floor to ceiling Crittal doors and a large rooflight spanning the length of the kitchen bring natural light deep into the plan. 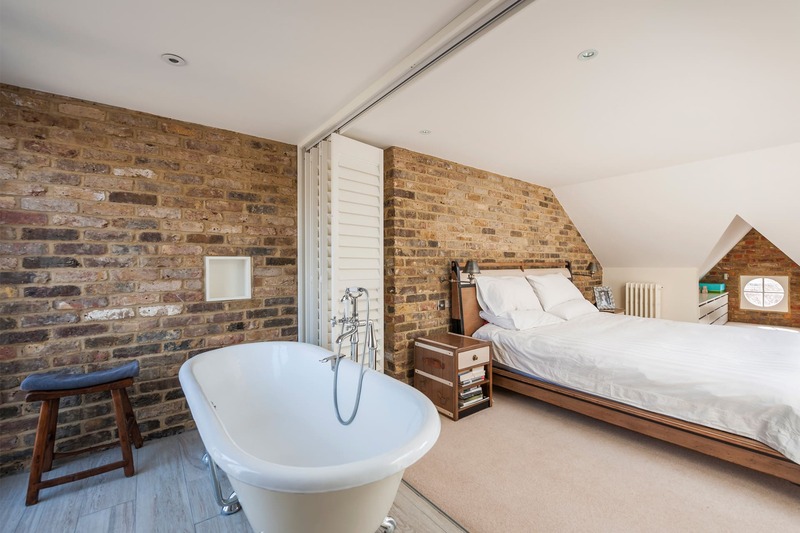 This loft conversion adds a new master bedroom to a three-bedroom terraced house, using bespoke carpentry to make efficient use of the space available. Due to the unique constraints of the site a large portion of this three-bed house needed to be sunk partially below ground level. Highly glazed courtyards and frameless rooflights ensure that the open plan kitchen and living space still receive ample natural light. This large side and rear extension features a full width glass box to the rear of the property, affording the new open planning living space unobstructed views out to the garden. This two-bed house sits on a small garage plot within the grounds of a listed building. The design makes efficient use of the space available and features a spacious open plan living space on the ground floor. 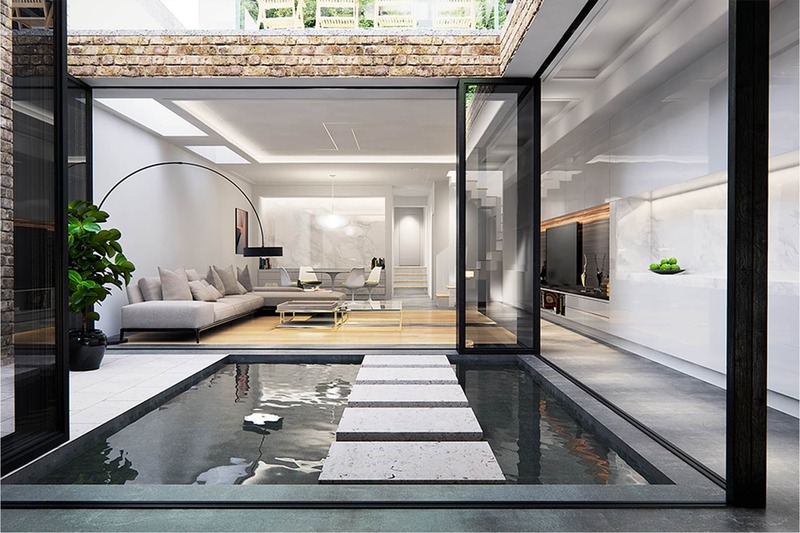 A large courtyard lightwell with floor to ceiling sliding doors ensures this open plan living space at basement level receives plentiful natural light. 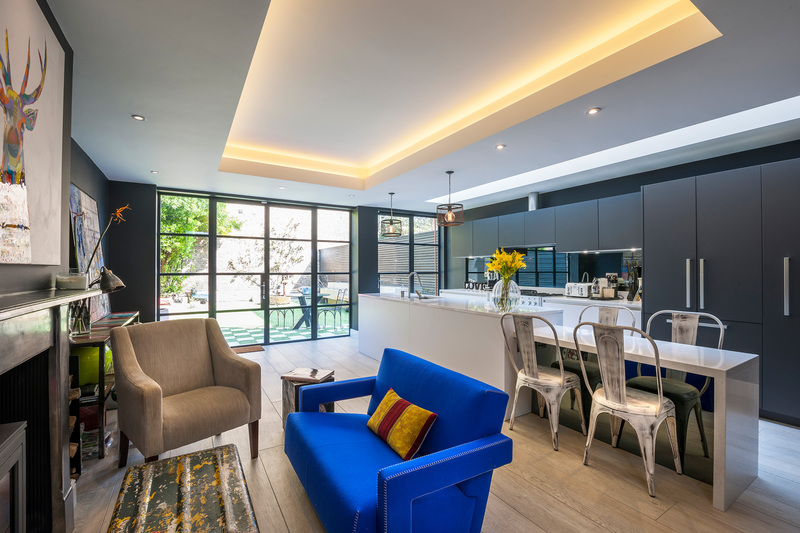 A large rear extension and basement conversion add an extra bedroom to this four-bed house in Clapham whilst creating a large kitchen, living and dining space. 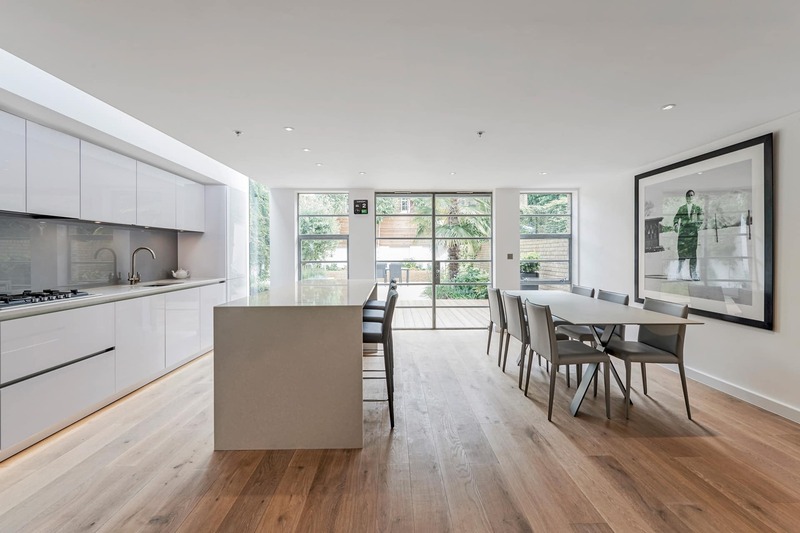 The current kitchen space in this three-bed house in Herne Hill is transformed into a large, open plan kitchen, living and dining space. A large rooflight to the rear of the space above the kitchen allows natural light deep into the plan. Copyright © 2019 Armstrong Simmonds Architects Ltd.